Am I qualified to give out awards for the BEST and WORST snack of 2011? Probably not, but I'm going to do it anyway. After 2.5 years of writing about snacks and small meals - I think I know a lousy snack when I see one. My criteria for a healthy snack are simple. Doesn't that look delicious? Can't wait to eat some wax and food coloring. These snacks are the worst because the front of the box advertises "REAL FRUIT" and parents WANT to believe that this snack is better than candy. But, these are just gummi-bears dressed up with some fruit juice. And the packaging just screams to kids so when you pass them in the store, you find yourself literally having to rip them from your child's hands. At $3.50 a BOX what are you paying for? The marketing? 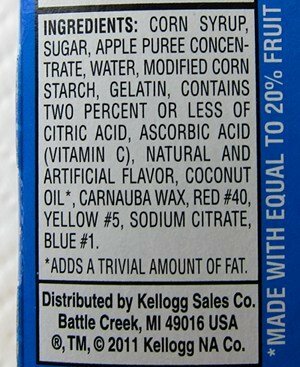 It is certainly not the product itself because they just mixed sugar with a little juice. Enough negativity! How about the BEST snack? Now this is difficult because there are so many great ones to choose from. My favorite snack is the simplest - it is an apple sliced with some peanut butter spread on it. I know it is dull choice but a fresh apple is so tasty and then just a wee bit of peanut butter adds some more protein and fat and keeps my tummy from grumbling. An apple has fiber, micronutrients, Vitamin C, etc. and you can find them everywhere! 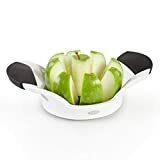 If you don't have a groovy apple slicer (see below) - buy two and put one in your office and one in your kitchen. My kids love slicing their own apples with one of these and we haven't lost a finger yet. The "Best Snack of 2011 Award" goes to an apple with peanut butter! What would you have chosen for best and worst snacks? I agree I love the apple and Pb but I go for PB2 by bell planatation, you have to try it!!!!! And we need to stop marketing junk to the little ones,as a mom with a health blog myself ( www.alwayshealthymom.com) I am sick of these fake healthy snacks, they need to go! I agree with the apple and PB too! I started eating apples when I craved sweet stuff and now I crave apples instead. I have another twist for the apple... Try it with very thinly sliced (and good quality cheese). I get Cabot or Boar's Head and break a slice into 6 to 8 pieces -- one piece for each apple slice. I particularly enjoy a spicy cheese. The mix of sweet and spicy is fabulous! Love your blog, Snack Girl. Thank you for all you do! LOVE Tina's comment about now she craves apples instead. That's awesome! Great post! I got a "Back to Basics Peel-Away" apple slicer for a Christmas present that I absolutely love! It's one of those old fashioned style gizmos where you turn a crank and it peels, cores, and slices the apple into a fun corkscrew shape that my kids go nuts for! And you can remove the peeler mechanism if you want to leave the peel on. It's the bomb! We've gone through about 3 or 4 apples a day since Christmas. Well, never thought of this but I am going to try it as my mid-morning snack at work next week. The diet starts on Monday and I know come 10am my brain will think I am starving! Off to buy peanut butter! I love peanuts, but don't seem to care for pb. I much prefer sunbutter, or almondbutter. Either or, I agree with you that any combination of apples and nut/seed spread is a healthy and yummy snack! I like the the healthy choice :). Was expecting a process food like a protein bar. 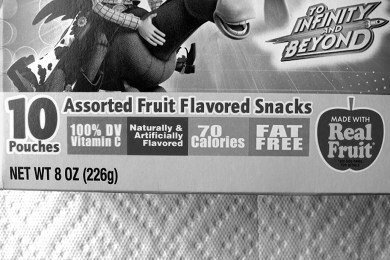 Guilty of buying those darned "fruit" snacks, I will never purchase them again! I made the conscious decision to eat real, healthy, whole foods this year. I love apples, especially the Honeycrisp ones! I am already feeling better and have dropped a few pounds. Snack Girl, I LOVE your site and YOU absolutely rock!!! Thank you for all of the great articles, recipes, and advice! I purchased cashew butter and prefer the taste of peanut butter with apples etc. Does anyone have any thoughts on how I can use the cashew butter in a recipe? LOVE all the quality apple varieties available now! Love topping the apple slice with the smallest bit of low fat cheese such as monterey. It is also good with pear slices. My father's favorite snack is a small slice of the monterey cheese topped with an apple or pear slice on a high quality cracker. I love this snack (and the slicer)! A fun twist on slicing is to core the apple and then slice thinly so there is a hole in the middle of each slice...I make the kids apple and peanut butter sandwiches this way.